I home educate my three children and I am always looking for new supplemental resources to include in our curriculum. I teach using the Charlotte Mason theory that children learn best through “living books” featuring engaging text that brings the subject matter to life. Therefore, I was very excited to discover the For Kids book series by Chicago Review Press that focuses on science, history and art. Each fascinating book is packed with information and exciting activities to help promote hands-on learning. 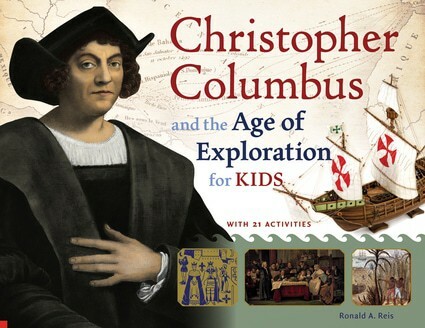 We are currently reading the latest release in the For Kids series in our history class, Christopher Columbus and the Age of Exploration for Kids: With 21 Activities (List Price $16.95/Kindle $9.66) by Ronald A. Reis. Transported back to the 1400’s, my children are learning about this famous Italian explorer by studying his life at sea, the danger of his exploration, his impact on civilization and the consequences of his voyages. I particularly value that this book includes detailed information about the indigenous people of the New World and how their lives were changed forever. It features all four of Columbus’s voyages to the new World and I appreciate that it gives a balanced look at his life i.e. not portraying him as a hero or a villain. The hands-on activities and illustrations are engaging, thoughtful and not only educational but fun too. For example, kids can learn to tie nautical knots, make a compass, make a model canoe, how to make an “Old World-New World Pizza” and hardtack, pan for gold and much more. My 3rd grader, 1st grader and Kindergarten were captivated by several activities including Creating a Coat of Arms for our family and their favorite was to Simulate a Hurricane. We use a lot of books in our homeschool and I find this book series exceptional for use in our American History class. It would be a wonderful supplement for any child who enjoys history or who is studying the Americas in school. The For Kids children’s book titles by Chicago Review Press is an exceptional series that will encourage their thirst for knowledge in a manner that is educational and entertaining. We are enjoying reading several other interesting books in this series including Albert Einstein and Relativity for Kids: His Life and Ideas with 21 Activities and Thought Experiments by Jerome Pohlen, Rightfully Ours-How Women Won the Vote by Kerrie Logan Hollihan and Verdi for Kids-His Life and Music with 21 Activities by Helen Bauer. There are many of wonderful book titles that we would love to add to our home library and I look forward to reading more in this series with my children. You are invited to view all of the titles in the Chicago Review Press For Kids Series and select your favorites! Many titles are available in hard copy or Kindle versions for your convenience. My girls would like the Archaeology book! Lewis and Clark for us here. Lewis and Clark! We are related to them! I’d love the Darwin and Evolution set! My son would like the Thomas Edison book set as he’s fascinated by invention. My kids would like Exploring the Solar System. Darwin and Evolution for Kids! They would like Exploring the Solar System. My niece would love the Darwin and Evolution for Kids! I would go with Exploring the Solar System! My grandkids would love the Exploring the Solar System: A History with 22 Activities. The Darwin and Evolution for kids set would be my choice. I think he would like exploring the solar system the best. No doubt it would be: Exploring the Solar System, She loves everything to do with planets, the sky, etc. My Step Daughter loves to draw and I think she would enjoy the Monet and the Impressionists for Kids: Their Lives and Ideas, 21 Activities.